There have been confusing arguments over the state of affairs in Nigeria, following consistent and incessant terror attacks on a part of the country, and terrorists' occasional incursion into some other major cities north of the country. The debate between Doyin Okupe via Skype, Funmi Iyanda and Peter Okwoche as moderator in BBC's 'Nigeria Not Losing Boko-Haram Battle', made the confusion more glaring. The title of the package based on Okupe's argument, is different from the original intent of the package - to showcase Nigeria losing the terror war - a continuation of Nigeria's opposing party's media position. Okupe is Nigerian government's spokesman. He tries to tell the world that major attacks by the terrorists in Nigeria have been confined to the North East. But the moderator tries to let Okupe into what he thinks is wrong in Okupe's assertion, using the bombing in Abuja, Jos and other parts of the North as attacks beyond the North East. Iyanda's position is that the Nigerian Army sincerely wants to fight the terror, but the army as an institution is broken like all other institutions in the country and the situation is not helping the fight against terror. At a point, the moderator asks Iyanda what are Nigerians saying about the situation in the country. I find that question as showing inadequacy in the moderator's preparation for the assignment. He is supposed to have done his own investigation and confront both Iyanda and Okupe with the truth. And this is the truth: Last week, I called a Nigerian living in Lagos and asked about the situation in the country, his answer was that the people in the North were decimating their own population and destroying part of their own heritage, because the terror attacks had not been anywhere near the South; terror had not overrun Abuja and terror was far from seizing or establishing authority in any part of the country. It is true that every institution in Nigeria is corrupt, but without alertness of security forces, Boko-Haram would have overrun the North and taken over Abuja. It was true that the terrorists at one time attacked Abuja and part of the North Central, but they were pushed back by the law enforcement and the terrorists had since concentrated their effort in the North East. They had slashed throats of innocent schools children sleeping in their hostels and the latest was the abduction of innocent girls from their school hostel from the same North East, before recent Abuja and Jos bombings. As a Nigerian, I had received telephone calls from people asking about my children's fate in Nigeria with Boko-Haram slashing students' throats and abducting girls in their hostels. My response has been that my children live very far away from spots of trouble in the country. Iyanda is right by her insistence that all institutions that are supposed to be helpful in the fight of terrorism are broken. The United States Under Secretary of State, Sarah Sewall confirms this in her testimony to the House Affairs Committe in Washington published by Nigeria's Punch, "Despite Nigeria's $5.8 billion security budget for 2014, corruption prevents supplies as basic as bullets and transport vehicles from reaching the front lines of the struggle against Boko-Haram." Corruption is deep in Nigeria. Every Nigerian knows it. Every Nigerian knows that there is little Goodluck Jonathan can do to redeem Nigeria from corruption. He can claim to be fighting the Augean Stable on the pages of newspapers, he knows that he has no power to deal with the godfathers of corruption in the country. They are the kingmakers. They made him to be vice-president before he became president, after a long struggle against the godfathers' will and opposition against his stepping into Late Shehu Yar'Dua's shoes. Part of the trouble or genesis of Boko-Haram is part of the godfathers' way to resolve political issues ever before Jonathan became president. 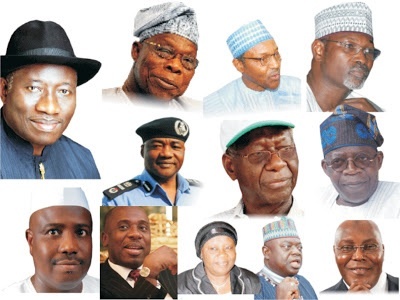 The terror became more intense against Jonathan's presidency, because the godfathers had accused Jonathan of taking away the presidency from their zone; they said he became president to complete Yar'Dua's term, but he had gone ahead having his own term and with temerity demanding a second term. Who are the people who institutionalized corruption in the country if not the godfathers who have remained untouchable for their hold on who becomes the leader? Was Sanni Abacha not just one of them? Why is it that all former military generals who masterminded the stealing of Nigeria to the bones aren't being mentioned in the context of Nigeria's misfortune, and Jonathan who think becoming a president of a country is a glorious achievement without thoughts about the evil he has inherited becoming the burden bearer and a scapegoat? I have looked at Jonathan's photograph used by the BBC in its latest coverage of Nigeria and the visage I see is that of a suffering president or a president who does not pretend to suffer while his country is besieged by terror. Will the opposition using the evil of terror to slam Jonathan and thinking the door is opened for it to take control of government allow Boko-Haram turn Nigeria into an Islamic State if it wins the election? If it will not, won't it be ready to continue with the Boko-Haram onslaught or is it part of its agenda to meet Boko-Haram's demand for an Islamic State that it is proposing a Moslem-Moslem ticket? I agree that Nigeria is broke as a nation and to redeem the country, corruption has to first be displaced. But who will bend the cat? It is easier said than done to fight corruption without the fighter of corruption becoming a victim of corruption, just like Jonathan administration has become for his taking more than the godfathers think is his entitlement. Yes, Nigeria is a rich country with a mass of poverty, especially in the north of the country. Who were those supposed to develop the country, but instead pocketed all resources for their personal use? Former military generals who abandoned and allowed their own region to be poverty ridden with their children missing in the education competition that assail the South. If Boko-Haram's grouse is lack of development and mass poverty in the North in comparison to the South as it is now being campaigned that poverty situation in the North is helping Boko-Haram, why can't the sect seek redress from former army generals who have cornered Nigeria's wealth; who are mostly from the North and instead of developing the North, developed their own personal estates? What did Yakubu Gowon, Murtala Muhammed, Ibrahim Babangida, Sanni Abacha and Abubakar Abdulsalam and other generals like Theophilus Danjuma did to develop the North? Is Jonathan to be held responsible for long period of neglect culminating in the manifestation of North's irredeemable past? Is Jonathan expected to use four years to undo the damage it has taken over 30 years of army rule to achieve? It is equivalent to blindness for anyone who is politically unbiased to put the cause of Nigeria's ailment on Jonathan, and it is unacceptable to forget the genesis of Nigeria's many years of accumulated problems, and expect Jonathan to be the magician to correct the ills in a jiffy.